As one of Connecticut’s first Energy Star builders, the Landworks / Nelson Construction team continues to focus on excellent design, quality materials, and energy efficient construction. In a changing world of environmental awareness and rising energy costs we lead the way by building better homes. Your new Landworks / Nelson Construction home should use far less energy than an average home due to our advanced construction techniques. In many of our homes, the energy use should be nearly 50% lower than a new similar, standard code-built home. This means lower operating costs, less demand on our limited energy supplies, and lower greenhouse gas emissions into the atmosphere. 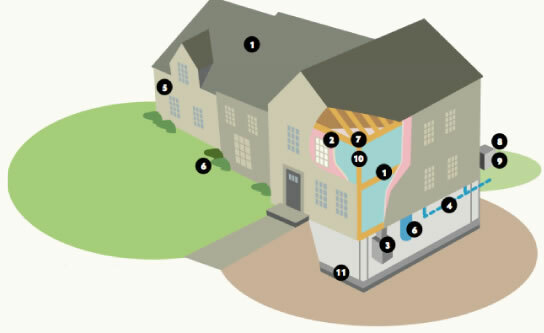 Our "Building Better" homes include Advanced Indoor Air Quality features. With tight construction, attention to indoor pollutant sources, and advanced air filtration, you and your family will enjoy a more comfortable and "healthier" home. We design and build homes to not only conserve resources, but age gracefully and last more than a lifetime. Engineered lumber and many of our selected building products are not only better and longer lasting than traditional lumber, but they are more "resource efficient", including the use of recycled materials. Recycled materials are in many building products like our concrete, insulation, and flooring to name just a few. Thermal performance: Superior insulation systems and Low-e Argon double glazed windows reduce the energy required to keep a home comfortable. Advanced HVAC equipment: High efficiency, right sized, multi-stage equipment lowers energy use while providing better comfort. Healthier indoor air quality: Fresh air supplies, superior filtration, humidity control, and attention to source pollutants help create an environment that contains less dust, lower pollutants, and more comfort. Durable low maintenance exterior: Masonry, siding and trim choices reduce costs and energy required to keep your home looking it's best. Lower water use: Lower flow plumbing fixtures, more drought tolerant landscaping and efficient irrigation systems all reduce unneccessary overconsumption of water. Advanced framing techniques reduce the wood required to build a house while enhancing the structural strength and ability to better insulate . Savings in time and cost to frame each home are reinvested in other Building Better systems. Moisture management: Right sized HVAC equipment, proper ventilation, and attention to the dew points in walls all work together to maintain healthier air and avoid premature costly repairs. Engineered lumber is stronger and it reduces scrap in the mills requiring fewer trees to build each home. Nelson Construction is proud to be a “Certified Green Professional” by the National Association of Homebuilders and to be the first company in Connecticut to participate in the Department of Energy’s “Building America” program, moving our industry toward zero net energy homes. As one of Connecticut’s first Energy Star builders, the Nelson Construction team has always been committed to excellent design, quality materials and energy efficiency. Building our homes with a focus on Energy Efficiency is important because it is meeting a responsibility we have to both our customers and our industry. Energy Efficient construction is also one more way we can show that the homes we build are superior to our competition. Our newest homes have been designed, tested and certified to use about half the energy of a home built just to today’s building codes. That’s good for our environment, and a savings of about $250 per month for each of those homeowners. This is a fantastic advance in energy savings considering the relatively small increase in construction costs to achieve this result. In addition, taking advantage of Utility sponsored and Federal rebates, some owners have opted to include solar photovoltaic systems driving the net energy use down even further. If you would like more specifics on how Nelson Construction sets the bar for energy efficiency in the homebuilding industry, we would encourage you to email us requesting the Case Study Report created by Building Science Corporation on our community, Hamilton Way, in Farmington. This report was meant to educate other industry professionals on how to build more energy efficient homes.